Running at sunrise or sunset can bring beautiful scenery and can be a great way to start or end your day. With daylight savings, however, its dark EARLY. Like way too early. Look outside, it’s not even 5PM and the sky is already going black! The days of sunset runs at 8:30PM are long gone and many of us must get our runs done in the morning before the sun is up or in the evening after the sun has set. Here are some quick tips our runners have discussed during these dark winter months. 1.Wear bright and/or reflective clothing and gear. Why not add a cute white puffer vest to your collection? If you don’t own white or bright outer layers or want to add advanced visibility, consider products like headlamps or lights & reflective apparel from noxgear. Bonus, they are local, headquartered in Dayton, Ohio! If all else fails, use your trusty iPhone flashlight app. 3. Run with a buddy… or maybe a group! There is safety in numbers. Check out local running groups to find training partners that may be nearby and within your ideal pace. 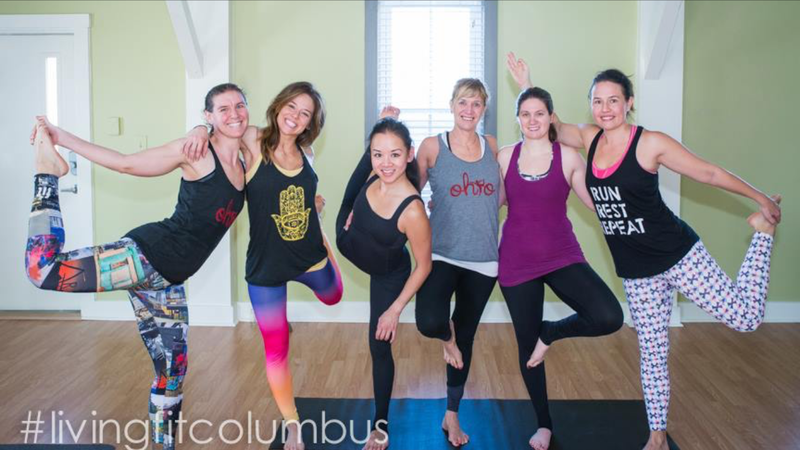 Columbus has many resources to connect you including MRTT Columbus and Columbus Running Co’s Facebook pages & groups. 4. Carry safety items with you including phone and perhaps even a whistle (we have one by GracedByGrit) or mace. Better safe than sorry. Are YOU afraid of the dark? Send us your tips, favorite products & more! WOW, its been too long since we’ve last posted. We could list a million reasons why, but the short answer is… sometimes life just sweeps you up and time flies by. 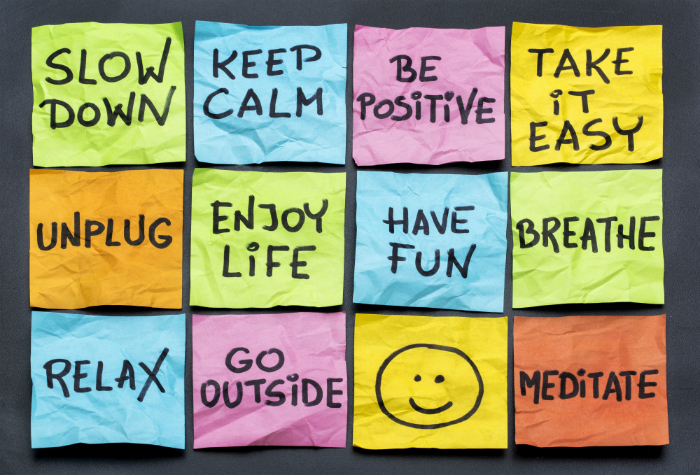 With the holidays approaching, we often get busy and sometimes stressed. So take a few minutes, SLOOOOOOOOOW down your pace and make some time to relax! This sequence and article came from our work wellness coordinator & certified health coach, Amanda Spring. She works for Mount Carmel and would make an excellent FITspiration/Fit Spotlight interview candidate in the near future! The info was adapted from My Fitness Pal. Yoga, as well as all forms of exercise, have been known to help increase mobility, flexibility, circulation, brain function and memory. Practice this quick Yoga flow to get your blood flowing, focus your mind, release tension, and set the mood for your entire day. Take these poses in order and hold for at least 5–10 breaths. During each pose, inhale and exhale through the nose to increase oxygen and build internal body heat. These 10 poses can be completed by people of all fitness levels. How to: Sitting on your heels, bring your torso forward and rest your forehead on the ground in front of you. 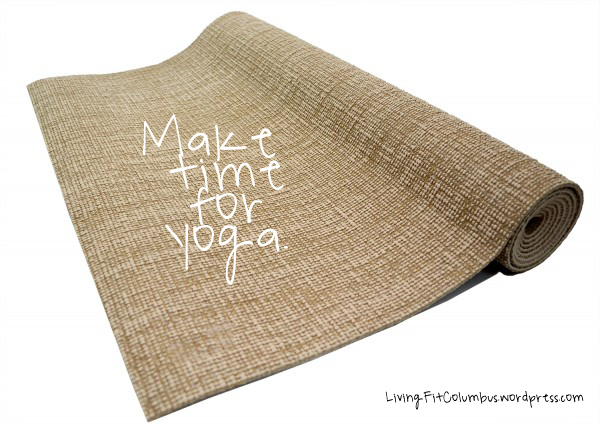 Extend your arms toward the front of the mat with palms facing down. Rest your chest in between your knees. Benefits: Relaxes the spine, neck and shoulders and increases blood circulation to the head. Tip: You can take this position anytime you’re feeling fatigued during your yoga practice. How to: Get on all fours with your hands under your shoulders, and your knees under your hips. Start with cow by curling your toes under during an inhale and dropping your belly while gazing up toward the sky. Transition to cat during an exhale by releasing the tops of your feet to the floor, rounding your spine and bringing your gaze towards your belly. Benefits: Keeps the spine healthy and improves abdominal strength. Tip: Closing your eyes while moving through cat-cow is encouraged. How to: Start on all fours and spread your hands shoulder-width apart and knees hips-width apart. Send your hips to the sky to create an inverted V shape with your body. Spread your fingers and toes as wide as you can to get as much grounding as possible. Benefits: Great stretch for the calves and helps boost blood circulation throughout the body. How to: Start on your belly with feet hip-width apart. Place your hands on the mat beside your rib cage with elbows bent, and peel your chest and upper ribs up off the floor. Benefits: Opens up the back, chest and shoulders, and awakens your energy source. How to: Stand tall with your feet hip-width apart and arms by your sides. Engage your legs and draw your tailbone down. Benefits: Improves posture and mental clarity. Tip: Try practicing mountain pose whenever you’re standing in line for something. How to: From mountain pose, bend your knees and try to get your thighs parallel to the floor while keeping your tail bone down and chest lifted. Benefits: Strengthens the ankles, calves and spine, and stimulates the abdominal organs. How to: Come into a lunge position with your back heel facing inward and your front knee directly over your front ankle. Keep both your hips facing forward and bring your arms over head. Benefits: Strengthens the chest, arms and legs. Tip: It’s OK to move your legs into a wider stance to get your hips to face forward. How to: From Warrior I, open up your hips to the side of the mat and extend your arms out with palms facing down. Make sure to keep a 90-degree angle and gaze out over your front middle finger. Benefits: Strengthens the legs, ankles and arms. How to: On all fours, slide your right knee forward toward your right hand and slide your left leg back. Square your hips to the front of the mat and bring your torso down into a forward bend over your bent right leg. Benefits: Lengthens and opens up the hip flexors, stretches the back, and opens the chest. Tip: Pain in the hips often reflects emotional pain. Opening up your hip flexors helps to relieve stress. your breath come naturally and close your eyes. Benefits: Calms the mind, relaxes the muscles, and improves concentration. Tip: Spoil yourself and stay in this pose as long as you wish. After browsing Aloha.com for a bit, and wishing we could magically transport our entire running group to a beachy tropical island, we got to thinking… how do we stay ‘healthy’ in the winter? Are there tips we could share with others trapped in this abyss of snow? 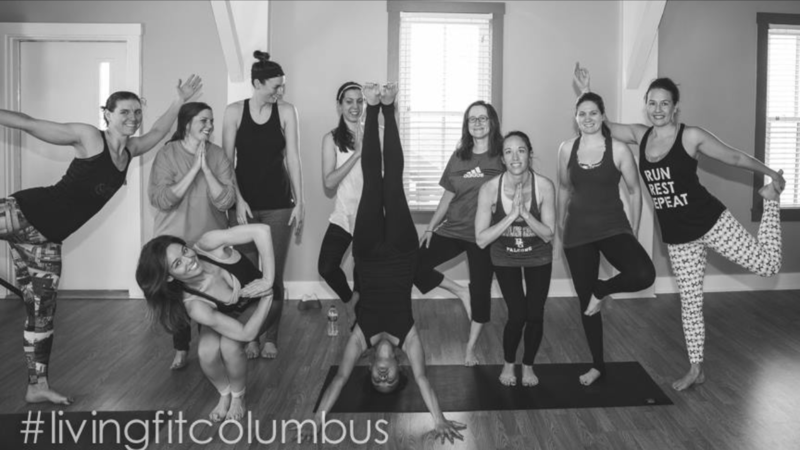 In the spring, summer & fall we stay healthy and fit, seemingly running & POGA-ing all over Columbus. Come Thanksgiving, however, a lot of folks begin hibernation [single digits, negative windchills, a FOOT of snow?!] Whether the air is too frigid or the trails are covered in snow and ice, we often have to find other means of staying healthy during these cold winter months. 1. Fitness Challenges. 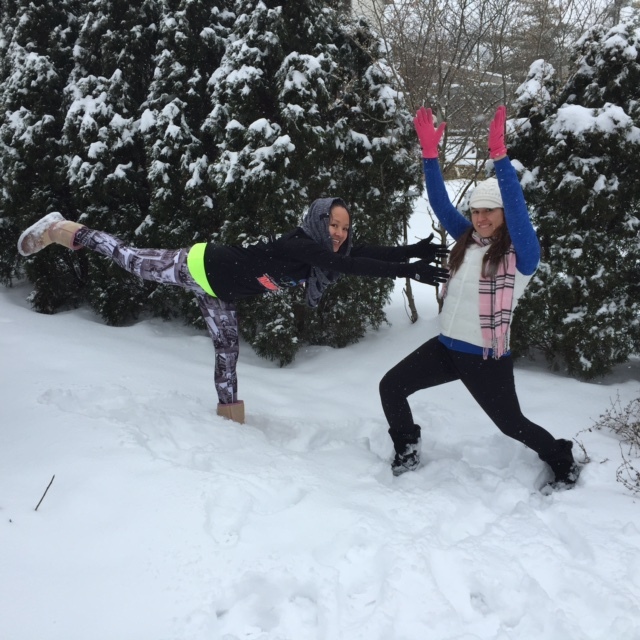 We participate in our annual Living Fit Columbus Winter Challenge as well as various [yoga] Instagram challenges. Just today we played a little #stopdropandsnoga! Weekly or monthly health related activities include nutrition, exercise, social support and community connections. The group camaraderie along with shout outs and prizes from local businesses go a long way in helping us stay motivated through the cold months. 2. Hydration, hydration, hydration! Between hours of hot yoga & the dry-your-skin-and-everything-else-out air, hydration in the winter is essential. As Aloha says, “Everything we put into our bodies should bring us a step closer to better health” ~ and we agree! Juicing, protein smoothies [try Aloha’s recipes!] and lots of water are super important. We use the ‘half your body weight in ounces’ rule, but the more water-based fluids you can consume, the better. 3. Hot Yoga. When it’s a balmy 6 degrees outside, who wouldn’t want to be sweating in a 90+ degree room? We love a hot & sweaty, toxin-flushing, fat-burning vinyasa yoga session! Yoga is a great compliment to our running routine and has many other benefits for your body, mind and spirit. 4. Indoor workouts. When in doubt, treadmill it out! Sometimes the weather just won’t allow you to run outside. So mix it up [check out our music interval idea] and make a date with your treadmill. 5. FIT book club. Since it gets dark too early to do group runs on Thursday nights, we created a fit book club for the winter months. We are currently reading The Running Dream and try to keep topics related to overall mind+body, including running, health, overcoming adversity, empowerment and more. We share healthy snacks and great conversations about the book and any upcoming fitness events. Although we look forward to sunshine, warmer days and returning to the park for runs & POGA events (pop up yoga in the park! ), we will remain healthy and happy with our winter fitness plan. That’s the ALOHA way! 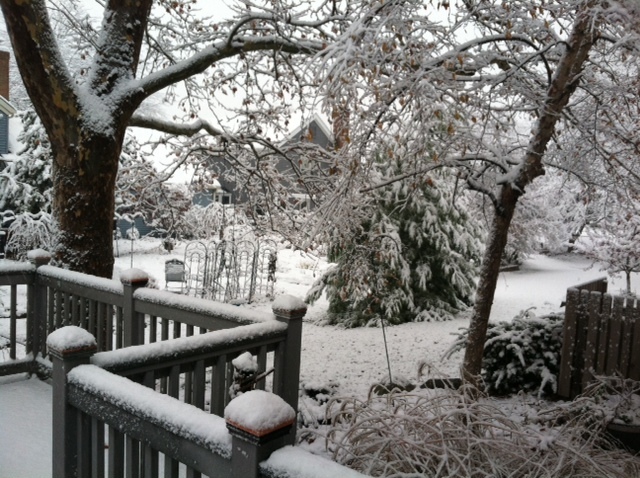 We woke up to several inches of snow today! As it gets colder, a lot of us cut back on our running miles and perhaps even exercise in general. There is so much shopping, baking, traveling, holiday movie watching to do that we often get busy and don’t make time. 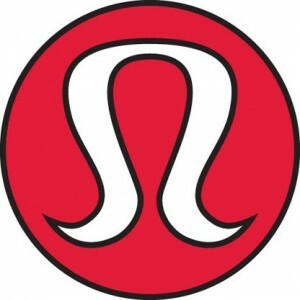 Take advantage of lululemon Polaris & Easton, as well as other apparel stores that offer complimentary yoga and fitness classes! Find a running group to join. You can see our Living Fit winter schedule HERE. Bundle up and get outside to PLAY! Remember when you were a kid and loved to play outside? 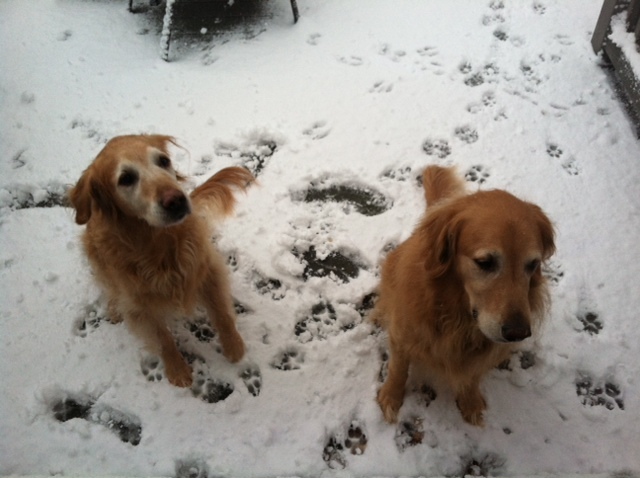 The doggies certainly love it! You can run, walk, jump, roll, sled (hill climbing!) ~ just get moving! You’ll burn calories and warm up. If going running, dress for success. That’s all for now! Off to bundle up and go get active in this snow!! !